Beam an instant mural at the flip of a switch with these imaginative bulbs hand-painted with heat resistant and non-toxic glaze by California artist Felicia Renaud. Clouds: Keep your head in the clouds with a dreamy sky motif. 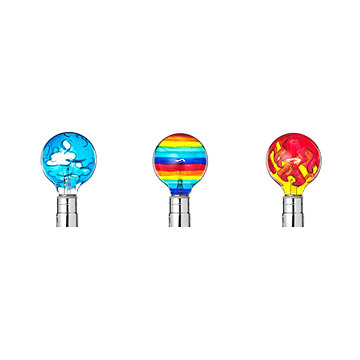 Rainbow: Make like Dorothy with this colorful bulb and you'll find yourself over the rainbow without leaving home. Flames: Try this fiery sight as a reminder of the heat you'll get for forgetting to turn the lights off. For ambient light only. Reusable as a tree ornament or suncatcher when the filter expires. Fits most lightbulb fixtures and works under white lampshades. 25-watt bulb, 2,500 hour lifespan or 3-5 years with 8 hours of daily use, up to 10 years. Click here to see the clouds, rainbows, and flames. Inspired by the idea of adding a mural to her high-school bedroom without the permanence of painting on a wall, Felicia Renaud began hand-painting light-bulbs, thinking they would create the same effect. After much trial and error, Renaud developed a heat resistant and non-toxic glaze that paved the way for her Mood Lights: colored lightbulbs with imaginative motifs and patterns. Renaud lives and works in California. Globe: 4" L, 3" dia., standard base. Fits standard lightbulb base. Do not touch when hot. Mood lights work best in dark room with white walls - image will be sharper and smaller if bulb is close to wall. If used with lampshade, effect will only be seen on shade. I bought both the Rainbow and Cloud bulbs for my daughter's dorm room and they are loved by everyone that sees them. I'll be buying more for several rooms in my own house! They are well made and just beautiful. I only wish there was a lamp sold with it to show off the bulb. It looks best in a corner against a wall so that the light diffuses on 2 walls and the ceiling. It's ok with a shade but sort of wastes a lot of the effect. Was a fun gift for a 20 something and we've received lots of comments on it. My niece loved the light bulb. The only complaint I have is that the online photo makes the bulb look a bit brighter than it actually was when we plugged it into a lamp. Overall, very nice and unique design and gift! Cool product. The bulb filaments may be a bit delicate so check when it arrives and treat gently. It's a beautiful, practical product! I came across Felicia's artistic creation about 2 years ago and thought this was really unique, interesting, clever and beautiful. I didn't buy any at the time, and kicked myself for not doing so, then came across the product again recently and am happy that I now own 2 - can't wait to have a bigger place so that I can have plenty more. I use these bulbs in my own home and also have given them as gifts. Children especially love them turned on when going to bed at night. They are very creative and the different colors and designs can produce many different moods depending on how and where they are turned on. Depending on what lamp shade you use and where you have the lamp located in your room will create different results. Overall I give this product an A for their design, colors, and the great moods they help to produce! I love these things! I have them all over the house to set a mood of intimacy. I have refered many friends over the years to this product and still give them as gifts every year for the holidays. Thanks so much for a great product. This is exactly what I wanted!! Love the Hand Painted Bulbs! I love the beauty and warmth of the Mood Lights hand painted bulbs. They make a lamp or fixture into a piece of illuminated art. They last several years and are energy efficient for an incandescent.